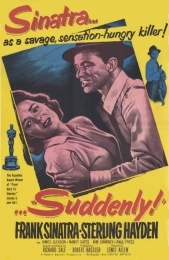 A previously unknown 35mm fine-grain negative of one of Hollywood's most controversial motion pictures, Frank Sinatra's SUDDENLY, the 1954 fictional film about the assassination of an American president, has been discovered by Los Angeles-based theatrical distributor Holland Releasing. "When SUDDENLY was first released, it was considered too disturbing by most audiences and so it was quickly pulled from theaters and soon forgotten", according to Holland Releasing's CEO, Tom Holland. "As far as we can tell, virtually all prints of SUDDENLY were destroyed and the negative missing. Up until now, all videos of the film, as well as the occasional TV broadcast, originated from the same splicy, grainy release print. Now that's all changed and audiences can soon watch this amazing piece of Hollywood history just as it was originally released in the 1950's." Holland continued. Frank Sinatra took the role of SUDDENLY'S psychopathic hit man in the wake of his Oscar-winning comeback FROM HERE TO ETERNITY. Although Sinatra's goal was to show Hollywood he had the makings of a serious actor, he may have gone too far in this choice of a frightening and highly unlikeable presidential assassin. Aside from Sinatra's performance, and the film's place in the American noir tradition, SUDDENLY is uncannily prophetic on the subject of assassination. Like Sinatra's MANCHURIAN CANDIDATE, the movie was pulled from circulation after the JFK assassination. According to Kitty Kelly's bio of Sinatra, Lee Harvey Oswald saw this film a few days before he took rifle in hand. Holland Releasing's newly-discovered negative is in mint condition, according to the company, and has just been scanned to high-definition video by Rainbow Productions in New York City. Holland Releasing plans a worldwide theatrical reissue of SUDDENLY as well as licensing to broadcast and Blu-Ray.